The purpose of this study was to evaluate the ability of the Dehydration Risk Appraisal Checklist (DRAC) to measure dehydration risk in nursing home (NH) residents. The DRAC includes items concerning health conditions, medications, fluid intake behaviors, and laboratory abnormalities that have been identified in the literature as risk factors for dehydration. Principal component factor analysis, known group comparisons, and multiple logistic regression were used to evaluate the criterion-related validity and reliability of the DRAC. After reducing the number of items on the DRAC on the basis of a correlation matrix, a single-factor solution with moderate internal consistency was supported. 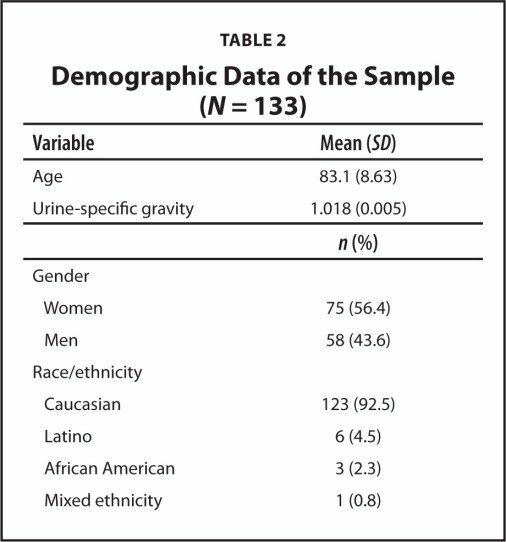 Further validity analysis demonstrated that NH residents with higher urine-specific gravity scored higher than those who had lower specific gravity. The psychometric properties of the DRAC indicate that it has potential in determining dehydration risk in NH residents. Future refinement of the instrument is also discussed. Dehydration in nursing home (NH) residents is a complex clinical problem that has implications for residents because of its link to a variety of adverse outcomes such as delirium, infections, constipation, renal failure, medication toxicity, and lengthened time for wound healing (Bennett, Thomas, & Riegel, 2004; Mentes & Culp, 2003) and for NHs vis a vis state and federal regulations. The prevalence of dehydration in NH residents is estimated between 30% and 33% (Colling, Owen, & McCreedy, 1994; Mentes, 2006; Mentes, Culp, Maas, & Rantz, 1999). In addition, the term dehydration is actually used to signify several different fluid/electrolyte problems, usually defined based on the concentration of sodium and fluid volume depletion (Thomas et al., 2008). Of all types of dehydration encountered in NHs, the most prevalent can be described as a preclinical state of early dehydration known as chronic underhydration (Bennett et al., 2004; Colling et al., 1994). In this case, the older adult does not adequately replenish fluids, which causes electrolyte abnormalities, most frequently hypernatremia (Weinberg & Minaker, 1995). Gaspar (1988, 1999), Kayser-Jones, Schell, Porter, Barbaccia, and Shaw (1999), and Chidester and Spangler (1997) examined fluid intake in NH residents and reported that between 50% and 92% of residents had inadequate fluid intake on the basis of a nutritional standard. The ability to detect chronic underhydration in addition to dehydration is important because age-related physiological changes in kidney function make older adults vulnerable to catastrophic events as a result of sudden shifts in fluid balance. Making the situation even more complex is the NH environment itself. NHs are chronically plagued by inadequate numbers of staff and high staff turnover (Burgio & Stevens, 1999; Schnelle, Cruise, Rahman, & Ouslander, 1998). In such an environment, a cost-effective strategy for assuring quality care is to focus on prevention of adverse events such as dehydration by identifying those residents at greatest risk and targeting interventions appropriately. Limiting the application of this strategy is the dearth of valid and reliable instruments by which to assess risk of dehydration. The purpose of this article is to describe the development and psychometric testing of the Dehydration Risk Appraisal Checklist (DRAC), which was designed for use by professional NH staff to identify residents at greatest risk for dehydration. Dehydration is a heterogeneous perturbation of water and electrolytes with no universally accepted definition (Vivanti, Harvey, Ash, & Battistutta, 2008; Weinberg & Minaker, 1995). Consequently, recognizing the signs and symptoms of dehydration is difficult in older individuals, and by the time symptoms are clearly identifiable, the condition is well advanced. Definitive detection of dehydration requires laboratory tests such as serum sodium, serum osmolality, and blood urea nitrogen (BUN)/creatinine ratio that are routinely not done in NHs. In addition, even when they are performed, the results are very difficult to interpret in older adults because of aging-related physiological changes. For example, the BUN/creatinine ratio is strongly affected by kidney function, comorbid conditions, and prescribed medications to treat these conditions (Kenny & Chiu, 2001; Thomas et al., 2008). In addition, abnormal blood chemistries are more diagnostic of dehydration and may be less useful in distinguishing risk for dehydration. Urine color and urine-specific gravity, on the other hand, may be better able to detect chronic underhydration that signifies risk for dehydration and has been a standard used to detect suboptimal fluid balance in athletes (Armstrong et al., 1994, 1998), recreational exercisers (Stover et al., 2006), and soldiers (Franseconi et al., 1987). Although these measures are also affected by kidney function, preliminary work has shown that NH residents with moderate to good renal function, as evaluated by a Cockcroft-Gault-estimated creatinine clearance, can concentrate their urine as evidenced by a significant correlation between urine color and specific gravity (Mentes, Wakefield, & Culp, 2006). Therefore, urine-specific gravity was used as the criterion measure for the validation analyses of the DRAC as the best, but not perfect, measure of risk for dehydration (Hodgkinson, Evans, & Wood, 2003). Other risk factors for dehydration in the NH population are difficult to delimit and have limited empirical support. Risk factors supported by the literature that are included on the original DRAC are presented in Table 1. The factors are categorized as personal factors (i.e., age and gender), significant health conditions related to dehydration (e.g., medical diagnoses of diabetes, dementia, congestive heart failure, repeated infections), intake behaviors (e.g., swallowing difficulties, receiving tube feedings, requiring assistance to drink), medications associated with dehydration (e.g., diuretic, laxative, and psychotropic agents; multiple medications), and laboratory values associated with dehydration. Specific to the NH population, an early study conducted by Lavizzo-Mourey, Johnson, and Stolley (1988) identified female gender, age older than 85, more than four chronic illnesses, more than four medications, and requiring assistance with transfer and ambulation as conferring risks for dehydration. Although this early study found that functional dependence conferred greater risk for dehydration presumably because the NH resident required reminders or sporadic help with drinking, this was not replicated in later studies, in which Gaspar (1999) and Mentes and Culp (2003) found that more physically functional residents, as measured by standard activities of daily living (ADL) scales (e.g., ability to toilet, transfer, and feed self), were at increased risk for dehydration. Gaspar’s (1999) study examined water intake from food and fluids in 99 residents living in three NHs. The results showed that inadequate water intake was associated with older age, higher levels of functional status, intact speech, semi-dependence with eating, few opportunities for consuming fluids (i.e., ingestion sessions), and inadequate nutrient intake. In a recent study by Mentes (2006), a typology of hydration problems was developed, and residents were categorized according to their hydration habits. Of the four hydration groups identified, those who won’t drink had the most dehydration events, defined as a hospitalization for dehydration, intravenous (IV) fluids for dehydration, or an elevated BUN/creatinine ratio greater than 25 to 1, the highest average urine-specific gravity and the lowest average fluid intake with meals. The DRAC was developed based on this literature review, using items that could be collected during an admission/baseline assessment and could be linked to Minimum Data Set (MDS) data. The initial version included 40 items in four categories: significant health conditions (17 items), intake behaviors (11 items), prescribed medications (5 items), and laboratory abnormalities (5 items), as well as age older than 85 and female gender (Table 1). These categories were not conceptualized as subscales. The instrument used a dichotomous, present/absent format. As conceptualized, the presence of a higher number of items implied higher risk. To assess content validity, the DRAC was reviewed by three nurses, both advanced nurse practitioners and PhD nurse researchers with expertise in hydration problems in older adults in NHs. These experts supported that the DRAC measured risk for dehydration in NH residents. 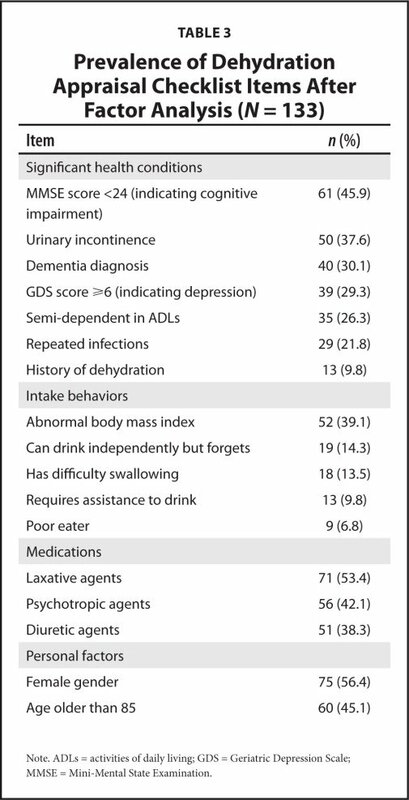 Specifically, they supported the inclusion of fluid intake behaviors, as these indicators have not been adequately considered in assessment yet are relevant in assessment of hydration problems in frail older adult NH residents. We used descriptive methodology to evaluate the reliability and construct validity of the DRAC. The data reported here were collected as a part of two studies that examined dehydration in NH residents. The first study examined the relationship between delirium and dehydration (Culp, Mentes, & Wakefield, 2003; Mentes & Culp, 2003), and the second study explored risk factors and effective interventions for dehydration in NH residents (Mentes, 2006). The combined sample included 133 NH residents from nine NHs who were screened with the DRAC. Residents lived in NHs in central and eastern Iowa (n = 98) as well as the greater Los Angeles area (n = 35). The Institutional Review Boards of the participating universities, as well as appropriate representatives of the NHs, approved the respective studies. All participants enrolled in the two studies described in this article either gave informed consent, or proxy consent was obtained from the participant’s legal guardian according to human subject regulations. All of the data collection was completed by trained research assistants or the study investigator (J.C.M.). Data to complete the DRAC were collected through chart abstraction and direct observation/assessment of participants. For example, items such as age, diagnoses, medications, and laboratory values were abstracted from the participant’s medical record, but information on urine-specific gravity was collected and analyzed using urine test strips and a urine analyzer. Residents were screened for depression and cognitive impairment using the Geriatric Depression Scale (GDS; Sheikh & Yesavage, 1986) and the Mini-Mental State Examination (MMSE; Folstein, Folstein, & McHugh, 1975). The Cognitive Performance Scale (CPS; Morris et al., 1994) was used to measure cognitive status for residents unable to respond to the MMSE. Functional status was measured using the functional status items from the Resident Assessment Instrument (RAI) of the MDS. Intake behaviors such a swallowing difficulty or poor eating were directly observed by trained research assistants during mealtime observations. Further descriptions of the procedures used in these studies have been published elsewhere (Mentes & Culp, 2003; Mentes et al., 2006). The GDS-15 was used to assess depression (Sheikh & Yesavage, 1986) because depression can confound efforts to manage hydration, as individuals who become depressed are usually anorexic and lack motivation/ability to care for themselves, which can interfere with fluid intake. This scale, which was designed specifically for older individuals, is most commonly administered verbally; the participant responds yes or no to a set of 15 questions related to mood, with a score of 6 or more indicating probable depression (Brink, 1993). This shortened form of the larger 30-item scale was selected to reduce response burden in a frailer and older long-term care population. The GDS has been widely used in a variety of elderly populations, including NH residents (McGivney, Mulvihill, & Taylor, 1994), and the shortened 15-item version is highly correlated with the original 30-item version (Lesher & Berryhill, 1994). Internal consistency of the GDS is adequate, with a Cronbach’s alpha coefficient of 0.76 (van Marwijk et al., 1995) and concurrent validity with other depression scales, specifically the Hamilton Depression Scale, with Cronbach’s alpha coefficients ranging from 0.62 to 0.82 (Brink, 1993). The MMSE is a well-known instrument for assessing cognitive status, including orientation, calculation, attention, recall and short-term memory, use of language, and constructional abilities (Folstein et al., 1975). This 11-item instrument yields a score of 0 to 30, with a score of less than 24 indicating cognitive impairment. The MMSE has internal consistency, with Cronbach’s alpha coefficients ranging from 0.54 to 0.96, and test-retest reliabilities of 0.80; validity has been determined by its correlation with other cognitive tests and some clinical tests (Smith, Breitbart, & Platt, 1995). The CPS was chosen to rate cognitive function in participants who were unable to complete the MMSE. The CPS is derived from several MDS items and categorizes individuals into one of seven levels of cognitive ability on the basis of the MDS items. The assigned score ranges from 0 (intact cognition) to 6 (very severe impairment) and has been validated against the MMSE (Morris et al., 1994). The cut-off point for this study to indicate cognitive impairment is 1 or higher, which is equivalent to a MMSE score of less than 24. Functional items from the RAI, taken from the most recent data from section G1: ADL Self-Performance of the MDS RAI for each participant, were used to assess functional status. Dependence in ADLs has been used to estimate functional impairment in NH residents, with dependence in more than three ADLs indicating a high level of dependence in self-care. Urine-specific gravity was determined using the Chemstrip® Mini UA™ urine analyzer (Boehringer-Mannheim Corporation, Gaithersburg, MD) along with Chemstrip 10M UA urine test strips, which were used to eliminate bias from using a visual color system for evaluating urine-specific gravity. The specific gravity readings obtainable from this analyzer ranged from 1.000 to 1.030 in 0.005 intervals. The Chemstrip Mini UA analyzer is a semi-automated analyzer intended for in-vitro semi-quantitative determination of urine analyses (Boehringer-Mannheim Corporation, 1994). The urine tests were conducted according to the manufacturer’s specifications, and the machine was maintained and calibrated accordingly by the investigator. Precision data for specific gravity provided by the manufacturer ranged between 73% and 100% from mean readings conducted in a reference laboratory on two samples tested per day for 11 consecutive days. Accuracy data provided by the manufacturer indicated that the analyzer operates day-to-day yielding results one color block above or below the mean. A positive control yields a positive result, and a negative control produces a negative result (Boehringer-Mannheim Corporation, 1994). Urine color was graded using a color chart developed by Armstrong et al. (1994, 1998) to assess hydration status. The colors range from pale straw (1) to greenish brown (8). Urine rated 7 or 8 indicates a dehydrated state. The color readings from the chart have been found to be significantly correlated with urine-specific gravity in elderly patients (Mentes et al., 2006; Wakefield, Mentes, Diggelmann, & Culp, 2002). The investigators were aware that certain foods and medications can discolor the urine (Watson & Jaffe, 1995) and thus provided the staff with a list of items that can cause this problem. The protocol was that when a color reading was determined to be affected by food or medication ingestion, those readings were noted but were not used in calculations. The reality was that institutionalized individuals did not receive food items or medications that discolored their urine (Mentes et al., 2006). Individual items from the DRAC were analyzed for frequency of occurrence, and the interitem correlations were explored. We initially reduced the number of items on the checklist from 40 to 20, on the basis of the frequency distribution of the items on the checklist and theoretical soundness. Items were discarded if fewer than 5 participants exhibited that sign or symptom. We then constructed an interitem correlation matrix and discarded 3 items that were negatively correlated across items (diagnosis of congestive heart failure, cerebrovascular accident, and diabetes). This reduction left 17 items on the checklist that were examined for construct validity including: age older than 85, female gender; cognitive impairment, depression, semi-dependence in ADLs, urinary incontinence, repeated infections, history of dehydration, difficulty swallowing/choking; body mass index (BMI) <21 or >27; being a poor eater (eats less than 50% of food), requiring assistance to drink, ability to drink independently but forgets, and use of diuretic, psychotropic (antipsychotic, antidepressant, and anxiolytic), and laxative medications. Internal consistency of these items was assessed using the theta coefficient. Construct validity was assessed using exploratory factor analysis. Prior to conducting the analysis, the Kaiser-Meyer-Olkin (KMO) and Bartlett’s sphericity tests were used to ensure the data for sample size adequacy and factorability. The KMO was 0.60 for this study, which, according to Kaiser’s (1974) criteria, is average for sample size adequacy. The Bartlett’s sphericity test was significant (0.000), indicating that this dataset was an identity matrix. Therefore, although the sample size of this study met the lower border of the requirement, the matrix was still factorable. Principal component analysis using SPSS version 15.0 was conducted to examine the underlying dimensions of the checklist. Construct validity was also assessed using the known group comparison technique and logistic regression to evaluate the criterion-related validity of the checklist. A total of 133 participants were screened with the DRAC (Table 2). They were all older than 65, with the oldest participant 100 years old. As might be expected, there were more women (56.4%) than men (43.6%) in the sample. Most participants were Caucasian (92.5%), as the majority of the sample resided in NHs in central Iowa. A small percentage of participants were Latino (4.5%), African American (2.3%), and of mixed ethnic background (0.8%). Table 3 shows the prevalence of the items on the reduced DRAC exhibited by these NH residents. The most prevalent items, exhibited in more than 50% of participants, were female gender (56.4%) and use of laxative agents (53.4%). Items present in more than 30% of the participants included age older than 85, abnormal BMI (<21 or >27), diagnosis of dementia, urinary incontinence, use of diuretic and psychotropic drugs, and presence of cognitive impairment. A theta reliability coefficient was computed as the best estimate of internal consistency for a one-factor solution (Zeller & Carmines, 1980). A theta coefficient is accepted as an analogue of Cronbach’s alpha that maximizes the value of the coefficient. The value of the theta coefficient was 0.68, which demonstrates moderate internal consistency of the DRAC. Factor Analysis. Principal component factor analysis was performed including the 17 items of the DRAC, which explained 16.3% of the variance. After examining the eigenvalues and a scree plot (not shown), it was determined that a one-factor solution could be supported. The magnitude of the factor loadings ranged from −0.012 (female gender) to 0.567 (urinary incontinence) (Table 4). Known Group Comparisons. Construct validity was assessed using known group comparisons, where participants having different average urine-specific gravity measurements are compared based on their score on the DRAC (Netemeyer, Bearden, & Sharma, 2003). Participants with higher (≥1.020) versus lower (<1.020) average urine-specific gravity had a statistically significant higher mean score on the DRAC, 5.9 versus 4.9 (t = −2.22, p = 0.028). Criterion-related validity was assessed using a logistic regression analysis with the dependent variable as the urine-specific gravity groups (high ≥ 1.020 and low < 1.020) and items on the DRAC that were significantly associated with specific gravity in univariate analyses at the p = 0.10 level. These six items included urinary incontinence, history of dehydration, use of diuretic agents, assistance in drinking, difficulty swallowing, and ability to drink independently but forgets. A backward stepwise logistic regression analysis retained only two of the items: difficulty swallowing (odds ration [OR] = 3.7, 95% confidence interval [CI] = 1.3 to 10.8, p = 0.017) and history of dehydration (OR = 3.2, 95% CI = 0.92 to 11.1, p = 0.068) in the final predictive equation. It is difficult to measure the risk for dehydration, given that intra- and interindividual differences may affect risk, as well as the fact that there is no gold standard for measuring risk for dehydration in diseased or healthy individuals. Armstrong (2007) grappled with the concept of risk for dehydration in a recent review of standard methods of assessing hydration, stating that a single physiological measure of hydration will not adequately reflect hydration status in every situation and population. He suggests that hydration, defined as adequate total body water for any individual, fluctuates around an average for the individual, given his or her health, daily activities, and fluid intake. Therefore, in determining dehydration risk, it may be most beneficial to know an individual’s fluid intake habits, health status, and levels of activity. In NH residents, given their frailty and lack of physical activity, fluid intake habits, functional abilities, health status, and medications can potentially serve as a cumulative indicator of dehydration risk. The DRAC incorporates these items on the checklist. Further, the factor analysis of the DRAC demonstrated beginning validity for the construct of risk for dehydration in NH residents. The single-factor solution supports that the 17 items on the DRAC measure this construct with a moderate internal consistency. Known group comparisons demonstrated a significant 1-point difference (6 versus 5) on the DRAC between residents with higher average urine-specific gravity and residents with lower specific gravity. This lends beginning support for the original assumption that the presence of more risk items, the higher the risk for dehydration. Further validity analyses indicate that specific items should be considered more carefully in determining dehydration risk, specifically, those NH residents who have difficulty swallowing or have a previous history of dehydration. Residents with swallowing difficulties are four times more likely to have a higher average urine-specific gravity than residents without swallowing problems. Swallowing problems are likely to be observed in individuals who have had a stroke or who are generally more frail or deconditioned (Vivanti, Campbell, Suter, Hannan-Jones, & Hulcombe, 2009; Whelan, 2001). This finding is consistent with reports in the literature that individuals with swallowing problems are more likely to develop problems with dehydration (Mentes, 2006). NH residents who have had previous episodes of dehydration were also more likely to have a higher average urine-specific gravity than those with a lower specific gravity. A history of dehydration episodes may serve as a proxy measure for individuals who have medical diagnoses and treatments that predispose them for hydration problems, such as diabetes or the use of diuretic agents. In addition, individuals who historically have had inadequate intake of fluids and marginal hydration status—who as older adults cannot adapt to sudden shifts in fluid balance without becoming dehydrated—may also have a history of dehydration. The evaluation of the DRAC lends beginning support for use of the revised, 17-item tool. The eliminated items presented different problems, including (a) redundancy (i.e., major psychiatric disorder and screening score for depression), (b) temporal inappropriateness (i.e., fever or nausea that occurs within a narrow window and would not be chronic), (c) low prevalence among long-stay NH residents (i.e., IV infusions), (d) items may have been subsumed under another factor (i.e., drools or holds food in mouth may be classified as poor eater), and (e) unavailability of items (i.e., laboratory values are not collected at all or frequently enough to help determine risk). In addition, female gender (−0.012), age older than 85 (−0.313), and use of diuretic agents (−0.415) included on the revised DRAC had negative factor loadings that require further scrutiny. The factor loading associated with female gender is extremely low and may not contribute significantly to dehydration risk in NH residents. 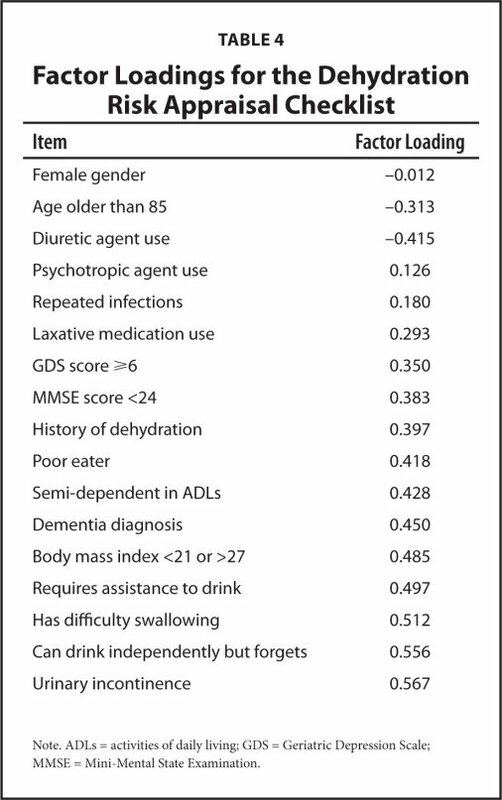 However, the factor loadings for use of diuretic agents and age older than 85 are intriguing; perhaps older residents are frailer and more dependent in ADLs and therefore receive more attention to their oral fluid intake than younger, more independent residents. They may also receive more medications in divided dosages, meaning they would have more incidental fluid intake with each dosage of medication. Use of diuretic agents is more difficult to decipher. Residents who take diuretic agents may be stimulated to consume fluid related to their increase in output. The small sample did not allow for more complicated analyses of the interactions of these factors nor allow for evaluation of the contribution of ethnic background to dehydration risk; hence, risk factors for dehydration in older adults of minority ethnicities may be different. Further testing of the revised 17-item DRAC will include a larger, more diverse sample and will consider the weighted contribution of various factors to the determination of risk for dehydration. Clinically useful instruments are essential to the provision of high-quality care, especially in vulnerable populations such as NH residents, for whom resources are limited. Given the difficulty obtaining and analyzing baseline and repeated laboratory tests or daily weights of NH residents to ascertain hydration status, as suggested by Armstrong (2007), the DRAC can be economical and relatively easy to complete. Many items on the DRAC are linked to MDS items that are already collected by the nursing staff; other items require observing the resident at mealtime. The DRAC can be used to screen for dehydration risk in NH residents; a higher score should alert nursing staff to an increased risk and should prompt them to monitor the resident’s fluid intake and drinking behaviors more closely. Armstrong, L.E. (2007). Assessing hydration status: The elusive gold standard. Journal of the American College of Nutrition, 26(5 Suppl. ), 575S–584S. Armstrong, L.E., Maresh, C.M., Castellani, J.W., Bergeron, M.F., Kenefick, R.W. & La Gasse, K.E. et al. (1994). Urinary indices of hydration status. International Journal of Sports Nutrition, 4, 265–279. Armstrong, L.E., Soto, J.A., Hacker, F.T. Jr.. , Casa, D.J., Kavouras, S.A. & Maresh, C.M, (1998). Urinary indices during dehydration, exercise, and rehydration. International Journal of Sports Nutrition, 8, 345–355. Bennett, J.A., Thomas, V. & Riegel, B. (2004). Unrecognized chronic dehydration in older adults: Examining prevalence rate and risk factors. Journal of Gerontological Nursing, 30(11), 22–28. Boehringer-Mannheim Corporation. (1994). Chemstrip® Mini UA™ operator’s manual. Indianapolis: Author. Brink, T.L. (1993). Statistical impact of truncated sampling or alteration of administration: The case of the Geriatric Depression Scale [Letter to the editor]. Journal of the American Geriatrics Society, 41, 465–466. Burgio, L.D. & Stevens, A.B. (1999). Behavioral interventions and motivational systems in the nursing home. In Schulz, R., Maddox, G. & Lawton, M.P. (Eds. ), Annual review of gerontology and geriatrics: Focus on interventions research with older adults (Vol. 18, pp. 284–320). New York: Springer. Francesconi, R.P., Hubbard, R.W., Szlyk, P.C., Schankenberg, D., Carlson, D. & Leva, N. et al. (1987). Urinary and hematological indexes of hypohydration. Journal of Applied Physiology, 62, 1271–1276. Gaspar, P.M. (1999). Water intake of nursing home residents. Journal of Gerontological Nursing, 25(4), 22–29. Kayser-Jones, J., Schell, E.S., Porter, C., Barbaccia, J.C. & Shaw, H. (1999). Factors contributing to dehydration in nursing homes: Inadequate staffing and lack of professional supervision. Journal of the American Geriatrics Society, 47, 1187–1194. Lavizzo-Mourey, R., Johnson, J. & Stolley, P. (1988). Risk factors for dehydration among elderly nursing home residents. Journal of the American Geriatrics Society, 13, 213–218. Lavizzo-Mourey, R.J. (1987). Dehydration in the elderly: A short review. Journal of the National Medical Association, 79, 1033–1038. McGivney, S.A., Mulvihill, M. & Taylor, B. (1994). Validating the GDS depression screen in the nursing home. Journal of the American Geriatrics Society, 42, 490–492. Mentes, J.C. (2006). A typology of oral hydration problems exhibited by nursing home residents. Journal of Gerontological Nursing, 32(1), 13–19. Morris, J.N., Fries, B.E., Mehr, D.R., Hawes, C., Phillips, C. & Mor, V. et al. (1994). MDS Cognitive Performance Scale. Journal of Gerontology, 49, M174–M182. Netemeyer, R.G., Bearden, W.O. & Sharma, S. (2003). Scaling procedures: Issues and applications. Thousand Oaks, CA: Sage. Omnibus Budget Reconciliation Act of 1987 and 1990. 6.2 CFR § 483.25. Sansevero, A.C. (1997). Dehydration in the elderly: Strategies for prevention and management. Nurse Practitioner, 22(4), 41–42, 51–57, 63–66, 69–70. Schnelle, J.F., Cruise, P.A., Rahman, A. & Ouslander, J.G. (1998). Developing rehabilitative behavioral interventions for long-term care: Technology transfer, acceptance, and maintenance issues. Journal of the American Geriatrics Society, 46, 771–777. Sheikh, J.I. & Yesavage, J.A. (1986). Geriatric Depression Scale (GDS): Recent evidence and development of a shorter version. In Brink, T.L. (Ed. ), Clinical gerontology: A guide to assessment and intervention. New York: Haworth Press. Silver, A.J. (1990). Aging and risks for dehydration. Cleveland Clinic Journal of Medicine, 57, 341–344. Snyder, N.A., Feigal, D.W. & Arieff, A.I. (1987). Hypernatremia in elderly patients. A heterogeneous, morbid, and iatrogenic entity. Annals of Internal Medicine, 107, 309–319. van Marwijk, H.W., Wallace, P., de Bock, G.H., Hermans, J., Kaptein, A.A. & Mulder, J.D. (1995). Evaluation of the feasibility, reliability, and diagnostic value of shortened versions of the Geriatric Depression Scale. British Journal of General Practice, 45, 195–199. Watson, J. & Jaffe, M.S. (1995). Nurse’s manual of laboratory and diagnostic tests (2nd ed.). Philadelphia: Davis. Weinberg, A.D., Pals, J.K., Levesque, P.G., Beal, L.F., Cunningham, T.J. & Minaker, K.L. (1994). Dehydration and death during febrile episodes in the nursing home. Journal of the American Geriatrics Society, 42, 968–971. Zeller, R.A. & Carmines, E.G. (1980). Measurement in the social sciences. The link between theory and data. London: Cambridge University Press. Dr. Mentes is Associate Professor, School of Nursing, University of California Los Angeles, Los Angeles, California; and Dr. Wang is Associate Professor and Director, Department of Gerontological Care and Management, Chang-Gung Institute of Technology, Kwei-Shan, Tao-Yau, Taiwan. The authors disclose that they have no significant financial interests in any product or class of products discussed directly or indirectly in this activity. This research was supported in part by an Individual National Service Research Award for predoctoral studies F31NO7254 (J.C. Mentes) from the National Institute for Nursing Research and a John A. Hartford Building Academic Geriatric Nursing Capacity Postdoctoral Fellowship (J.C. Mentes). The authors gratefully acknowledge Dr. Linda Phillips, Professor and Adrienne H. Moseley Endowed Chair for Nursing at University of California Los Angeles School of Nursing, for her thoughtful guidance in the completion of the manuscript. Address correspondence to Janet C. Mentes, PhD, APRN, BC, Associate Professor, School of Nursing, University of California Los Angeles, 5-262 Factor Building, Los Angeles, CA 90095-6919; e-mail: jmentes@sonnet.ucla.edu.